Hotovely says decision was made because of ‘complexity and diplomatic repercussions. The International Raoul Wallenberg Foundation expressed “deep disappointment” in the Knesset’s rejection of a bill to recognize the Armenian genocide earlier this month. The Raoul Wallenberg Foundation sent a letter on Thursday to Knesset Speaker Yuli Edelstein, with a copy to Hotovely and Yesh Atid leader MK Yair Lapid, who sponsored the bill. Edelstein called on the government in 2015 to change its stance, and in 2016 the Knesset Education Committee recognized the genocide. However, any motion for official state recognition of the genocide has failed to go through. “Regrettably, this voting down has been repeating itself, time and again, for the last few years, as a constant ritual,” read the letter, signed by foundation chairman Eduardo Eurnekian and founder Baruch Tenembaum. “With all due respect, we are not able to understand, let alone justify this stance,” they said. “Israel is the national home of the Jewish people, who suffered an indescribable plight during the Shoah [Holocaust]. Eurnekian and Tenembaum observed a “deep connection” between Jews and Armenians. 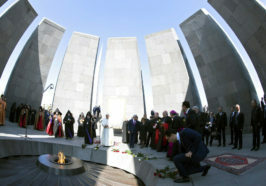 The NGO, which works to recognize Righteous among the Nations, notes that 24 Armenians have officially received that title so far, which is a large number in relation to the size of the population.